Slide the casing onto the pipe before welding. Mark installation area of the casing. Clean and degrease PE jacket to be covered with TIAL-TUM up to a distance of 200 mm from the edge of the jacket. Preheat the prepared surface up to +40°C. Cut TIAL-Z adhesive tape according to perimeter of circle (if supplied in 30 meter rolls). Wrap adhesive tape over PE jacket within marked edges. Place spacers at 10 and 2 o?clock position at the edge of the jacket. Drill a hole of 25 mm in diameter at a distance of 150 mm from casing end. Install the casing according to marking. 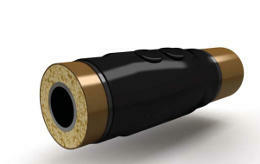 Shrink casing ends with gas torch flame. Allow the casing to cool down up to 40°С. To check quality of the sealing perform air pressure test. Degree of internal pressure to be maintained in compliance with project requirements. Drill a second hole of 25 mm in diameter. Perform foaming of the joint with the help of filling machine, foam kit or other method which ensures qualitative mixing of PUF components. Mixing is carried out according to requirements of PU foam components manufacturer. After PU foam has hardened, weld up holes in the casing with PE plugs and install PE patches onto the welded plugs.